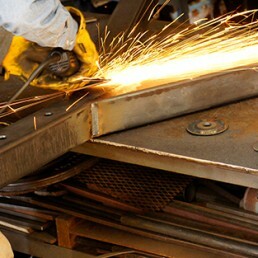 MetalWork Austin provides full service, Turn-Key metal fabrication. 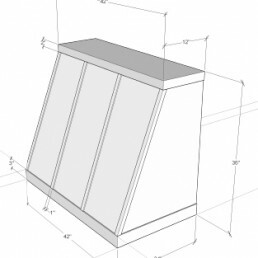 From design to fabrication to installation, we will take care of your project smoothly and efficiently. At MetalWork Austin, we know Metals. It’s what we do. Our extensive knowledge of metals and fabrication work can help you figure out the large or small details of your project. Whether you are a homeowner looking to figure out how to implement metalwork in your home improvement project, or an experienced designer or architect that just needs a metal specialist to help make sure your plans work effectively: we can help. Initial consultation and general information is free of charge, but extensive consulting requiring research and or many meetings will incur some hourly labor charges. If you have just a crazy idea and can’t draw, If you just have basic drawings & need us to work out the functionality and details, or if you have 3D models and need someone to make shop fabrication drawings, We know how to make metal designs and details work & we are happy to take on the design aspect of your project. We can offer simple hand-drawn plans, to-scale 2d illustrations, and even full 3d model design. There aren’t very many fabrication shops that are as capable and willing to take on crazy ideas and new concepts as MetalWork Austin, and we pride ourselves on the creativity and originality that we can bring to any metal project design. Design work is charged as hourly labor for any project that requires more than 30 minutes of time. 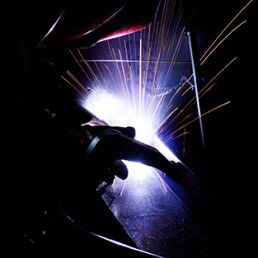 MetalWork Austin employs some of the most skilled welders and fabricators in the central Texas area. Through careful design, layout, and welding procedures we ensure that everything we do meets extremely high standards of quality. We are fully capable and comfortable using all methods of welding and joining almost any type of metal: Steel, Stainless Steel, Aluminum, Brass, Bronze, Copper, and more. If it can be welded, we can most likely do it. Finish work is what separates good metalwork from astonishing metalwork. MetalWork Austin takes time to finesse every piece on each project to a professional grade finish. We can sand welds to a seamless finish & we can offer all types of popular finishes: Blackened Steel, Satin Polished Stainless / Brass / Bronze, Traditional Patinas, Antiqued Patinas, Copper Patinas, Darkened Bronze, Burnished or Grained finishes, Powder Coats, Rust Patinas, Clear Coats, Buffed Wax finishes. We specialize in modern & traditional finishing techniques and can talk you through what any of these require. We make sure that each and every client knows what to expect and will be completely satisfied with their end product. If we build it, we can install it. 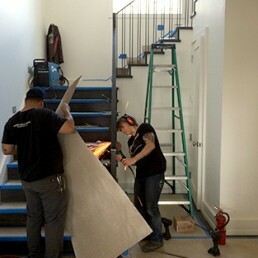 MetalWork Austin is efficient and conscientious when it comes to installing projects that we build. You can rest assured that the installation process will go as smoothly as possible when we are on board, due to our conscientious and deliberate installation methods. Delivery and pickup options are available, as well. Due to the sometimes unpredictable nature of installations, they are charged hourly, including load-in and drive time. Perfect for signs, furniture, small complex parts, and much more: CNC Plasma cut metal is a great way to create beautiful work at a fraction of the time. Our CNC plasma table is capable of cutting up to ¾” steel, and precise enough to cut fairly intricate patterns on thinner materials. 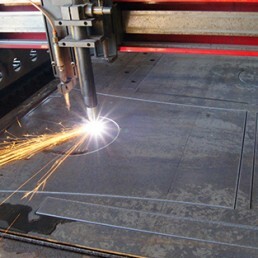 We can take an image you provide, program that image into a cut file, and cut it from metal for any project. Many shops that offer CNC cutting require that you set the file up for them exactly and in a specific format, but at MetalWork Austin we can help you with that, as well as offering design ideas for your cutting. If you don’t have the time or means to make a perfect design, we have talented designers that can help with proper layout and proportion to make your ideas look great. Though most of our work would be considered quite modern, the team at MetalWork Austin has quite a bit of experience in old-world metal working techniques. 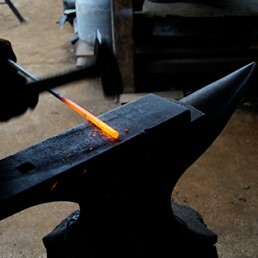 This includes forge work, hammering textures, hand-formed scrolls, riveting, bending parts, and shaping many classic designs. If your project calls for an old school look and approach, MetalWork Austin has you covered. CAN METALWORK AUSTIN HELP YOU WITH A PROJECT? Click over to our Contact Form to submit a request!